Our Inn Coordinator, Madeliza, was doing her typical shopping for a romance package at Harvest Market, and brought back a magazine, Delicious Living, that sparked interest! Inside I was delighted to find many essential oil recipes, healthy eating tips, and the snack I am about to share with you. 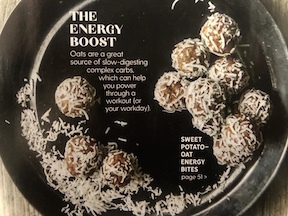 These Sweet Potato-Oat Energy Bites are just the portable power treat I need to keep me going and to satisfy my ever-so-needy sweet tooth. Place sweet potato in streamer basket set in pot with at least 1 inch of water. Bring water to a boil and steam sweet potatoes until for tender—about 10 minutes. Set aside to cool. Alternatively, you can also boil the sweet potato until tender. Place pecans, oats, and dates in food processor container and process until finely chopped. Add sweet potato, flaxseed, honey or maple syrup, orange zest, allspice, and salt to container and blend until mixture clumps together. Using damp hands, form mixture into 1 inch balls. You should get about 16 balls. Spread coconut out on a plate. Roll balls in coconut and chill in refrigerator to help firm up. Keep chilled until ready to use.